Looking for fractured fairy tales? This list includes some of my favorite picture book retellings of classics like Goldilocks and Little Red Riding Hood and Snow White, plus novels for elementary schoolers or middle schoolers with those familiar stories re-spun in clever and funny ways. 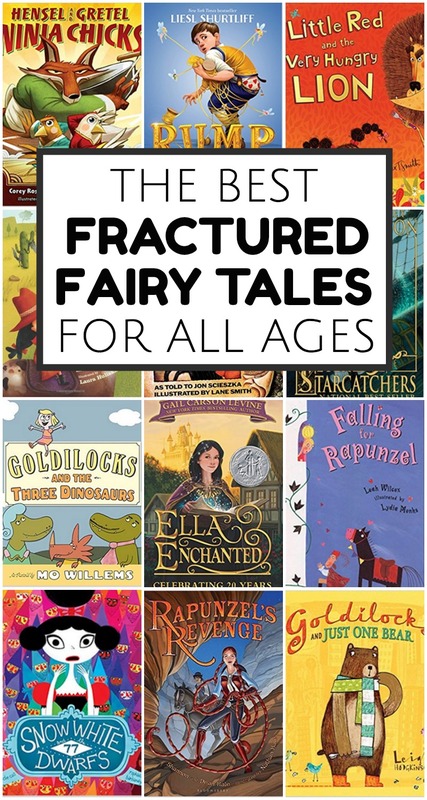 Check out the whole fractured fairy tales list! Fractured fairy tales are one of my very very favorite categories of books, whether it’s in a picture book or a longer novel. I love seeing how an author takes the traditional source material and makes it feel fresh and new or reinterprets something in a completely new way. These are some of my very favorite fractured fairy tales – I think you’ll love them too! The Three Pigs by David Wiesner – I will never get tired of David Wiesner. In this one, the three little pigs get blown out of the story when the wolf huffs and puffs, and they find themselves popping in and out of all sorts of other fairy tales. Goldilocks and Just One Bear by Leigh Hodgkinson – In this reverse story, one bear goes for a walk and finds himself lost in the city. So he lets himself into an unlocked apartment for a little nap. Little Red Hot by Eric A. Kimmel and Laura Huliska Beith – I do believe I read this fractured fairy tale to Ella 1,000 times the year she turned four. Little Red loves spicy food and she uses her fire-proof tastebuds to get the best of the big bad wolf. The True Story of the Three Little Pigs by Jon Scieszka and Lane Smith – This is the first fractured fairy tale I remember. My grandmother gave this to my dad when I was a kid and it’s remained one of my favorites. In it, the Big Bad Wolf shares his side of the story (he was framed!). Goldilocks and the Three Dinosaurs by Mo Willems – If you know Mo Willems from his Pigeon books or Knuffle Bunny, you know to expect great things. And you won’t be disappointed. Lon Po Po by Ed Young – This Chinese version of Little Red Riding Hood won the Caldecott medal and definitely has a bit of a scary edge to it. The Jolly Postman by Allan Ahlberg and Janet Ahlberg – This classic has held up surprisingly well in our house, despite all the parts. And show me a child who doesn’t love all the tiny letters and envelopes, and I’ll show you a pretend child. The Frog Prince, Continued by Jon Scieszka and Steve Johnson – Life as a prince isn’t everything one might have hoped. In fact, the Frog Prince would rather just be a frog again. But it’s surprisingly hard to find a witch to change one back into a frog. Little Red and the Very Hungry Lion by Alex T. Smith – In this version of the classic Red Riding Hood story, it’s not a wolf that tries to intercept Little Red, but a lion. And whoa, does he underestimate what he’s getting himself into when he decides that an old grandma would make a delicious lunch. Falling for Rapunzel by Leah Wilcox and Lydia Monks – When the prince rides up to Rapunzel’s tower, he calls up, requesting that she throw down her hair. But she keeps misunderstanding him and sends down one thing after another, like when he asks for curly locks, and she tosses down her dirty socks. If your kids don’t crack a smile, I’ll be shocked! This duo’s Waking Beauty is also hysterical. Prince Cinders by Babette Cole – Poor Cinders. He just want to be like his big hairy brothers, but when the fairy grants his wish, “big and hairy” translates into “ape.” Cinders doesn’t realize it, though, and heads off to the dance unaware the he’s an animal instead of a handsome prince. Hensel and Gretel: Ninja Chicks by Corey Rosen Schwartz and Dan Santat – I LOVE this series of ninja fairy tales (it also includes The Three Ninja Pigs and Ninja Red Riding Hood). All of the characters take care of themselves, and the rhyming scheme is superb. Plus, the illustrations have so much movement and feel like they’re popping right off the page. Snow White and the 77 Dwarfs by Davide Cali and Raphaelle Barbanegre – A cozy cottage with seventy seven dwarves seems like a great solution when you’re fleeing an evil queen. But pretty soon, when you’re making 77 breakfasts, combing 77 beards, and telling 77 bedtime stories, a poisoned apple leading to a very long nap actually sounds pretty appealing. Ella Enchanted by Gail Carson Levine – I know the movie is terrible. The book is anything but. Forget Anne Hathaway and read it. This fractured fairy tale is probably in my top ten favorite books. Rump: The True Story of Rumpelstiltskin by Liesl Shurtliff – Who knew there was so much backstory behind Rumpelstiltskin? (She’s also written Red about Little Red Riding Hood and Jack from Jack in the Beanstalk). Beauty by Robin McKinley – This was probably the first fairy tale retelling I ever read. I love this Beauty and the Beast story so so much. Rapunzel’s Revenge by Dean Hale, Shannon Hale and Nathan Hale – I don’t read a lot of graphic novels on my own, but this one is just 100% delightful. How can you not love the idea of Rapunzel using her long hair as a lasso? What other fractured fairy tales did I leave off the list? Let me know in the comments! Great list once again. When I was little there was a cartoon version of Fractured Fairy Tales that was one of my favorites and my daughter and I loved the Faerie Tale Theatre series of videos with Shelley Duval. 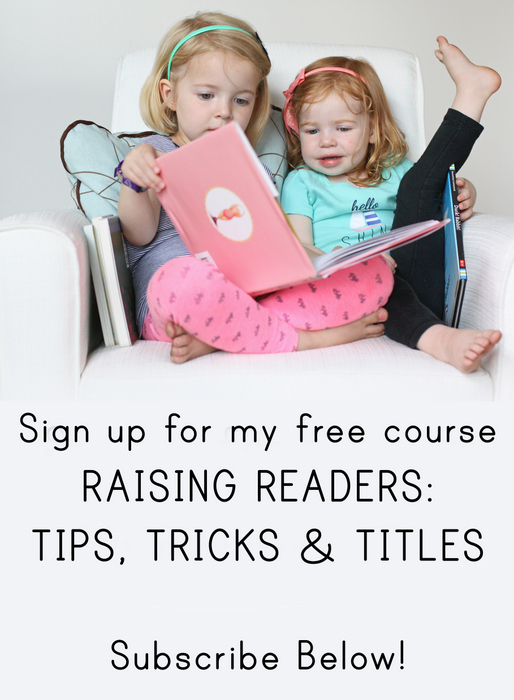 Here is a list of Fairy links: http://www.teachthechildrenwell.com/other.html#fair. I love these weekly themed book posts! Beauty is in our "to read" stack; I think it will have to find it's way to the top! I loved the Jolly Postman when I was younger and can't wait to get it for my girls when they're a bit older. We just finished reading Goldie and the Three Bears, which was a big hit, and I just ordered a couple of the BabyLit books, which are always favorites around here. Such a fun list! I'm going to check out the chapter books for my oldest daughter! I love the True Story of the 3 Little Pigs – so clever & funny! Loving this series! Such a huge help when I'm tryingoto find something to do on these hot Texas days. For classic fairy tales, we love Paul Galdone. I love this list! I've been a fan of older-audience fairy tale rewrites for years (a la Gregory Macguire, starting with Wicked). I'm really excited to find a good list of kid-friendly ones. I've been reading "Good Night, Good Night, Construction Site" to my son lately. He loves it! Goldilocks and Just One Bear looks so cute! I love the illustrations. We'll have to see if our library carries it. I'm reading The Happiness Project. I am currently reading The Port Chicago 50 by Steve Sheinkin (of Bomb fame); it's pretty fascinating/horrifying. With the boy we've been reading Inside Outside Dinosaurs, which is very cool. I just finished reading Elizabeth Bunce's A Curse Dark as Gold, which is juvenile fiction (my 15 year old loved it). It is a take off of Rumplestiltskin with even more magic thrown in. When my girls were little, they loved Rumplestiltskin's Daughter by Diane Stanley. I just finished The Light Between Oceans. A story of miscarriages, still borns, and being separated from your baby/toddler is not the best choice when you're 37 weeks pregnant. Rapunzel's Revenge is pretty swell. Shannon Hale never disappoints. As far as Fairy Tales retold, I'm really loving Marissa Meyer's Lunar Chronicles. Who knew that what I was missing in my life was a cyborgian retelling of Cinderella? Also, because I know you are a big audio book fan, this series has a fabulous audio version. The Princess and the Pig by Jonathan Emmett is one our family's favorite fractured fairy tales. Very clever! This totally takes me back! Off to the library to check out the True Story of the Three Little Pigs! LOVE this series btw! I'll have to add some of these to our daughter's library! Oh, I love retellings as well. Some of our favorites are: The Three Little Javelinas, Fanny's Dream, and CinderEdna. Along with the ones you mentioned, some of my favorites for adults/teens are: Princess of the Midnight Ball by Jessica Day George, Just Ella by Margaret Peterson Haddix, Bound by Donna Jo Napoli, Wildwood Dancing by Juliet Marillier, and Toads & Diamonds by Heather Tomlinson. My favorite fairy tale spin off is The Three Cajun Pigs. It's just as much fun for me as it is or my daughter because I make myself laugh trying to read it in a Cajun accent. For kids I love Mind Your Manners B.B. Wolf (not exactly a fairy tale, but lots of storybook characters) and for grown-ups The Magic Circle by Donna Jo Napoli is the BEST and a super quick read. 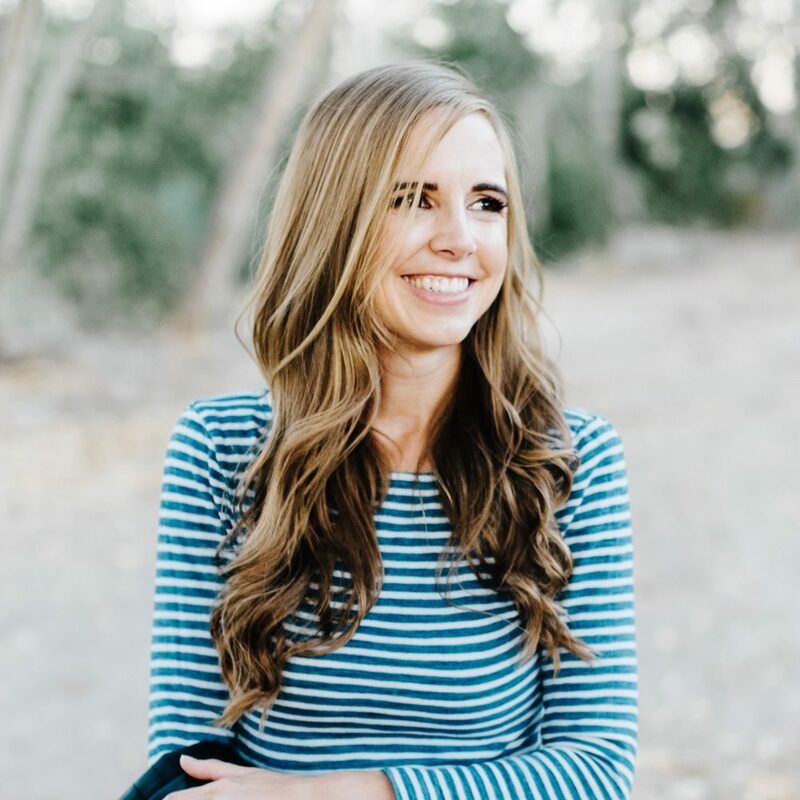 This is an awesome book roundup (and I totally agree with you on Ella Enchanted, one of my favorite books growing up) – thank you so much for sharing. I finished Where'd you go, Burnadette? in less than 2 days this past weekend – great summer read! Jon Scieszka was pretty much the staple of my childhood. I love his books! Great list, once again! Falling for Rapunzel and Waking Beauty by Leah Wilcox are both fun reads with 5 stars on Amazon. Thanks for more ideas! I love your list. I love it when old stories get retold in a different way. The musical Wicked fits this perfectly. And I LOVE Caravan Shoppe!! I love this list! After reading this I took my girls right to the Library. Unfortunately we only walked out with Goldielocks and Just One Bear, but my oldest and I LOVED it! Had to read it again after we finished the first time per the request of my daughter, she's never done that! It's now in my shopping cart on Amazon. 🙂 Thank you for sharing!!! Thanks so much for doing these round-ups! My little library only has a few of these books, but I'm excited to do some of the activities with my kids. I also LOVE caravan shoppe & would love to win! * The Hero’s Guide to Saving the Kingdom (League of Princes), by Christopher Healy–I’ve only read the first one of these, but it was hilarious! Even my husband read it and thought it was funny, and our reading tastes rarely overlap. *The Princesses of Westfalin trilogy, by Jessica Day George. Also, Sun and Moon, Ice and Snow by her. *Half Upon a Time, by James Riley–teen retelling and so sarcastically funny! Okay, I’ll stop now. 🙂 So fun! One of my students brought in a book to share this week. It was a version of Frog Prince that she got at Ikea. Super cute fractured fairytale that involved other fairytale characters!